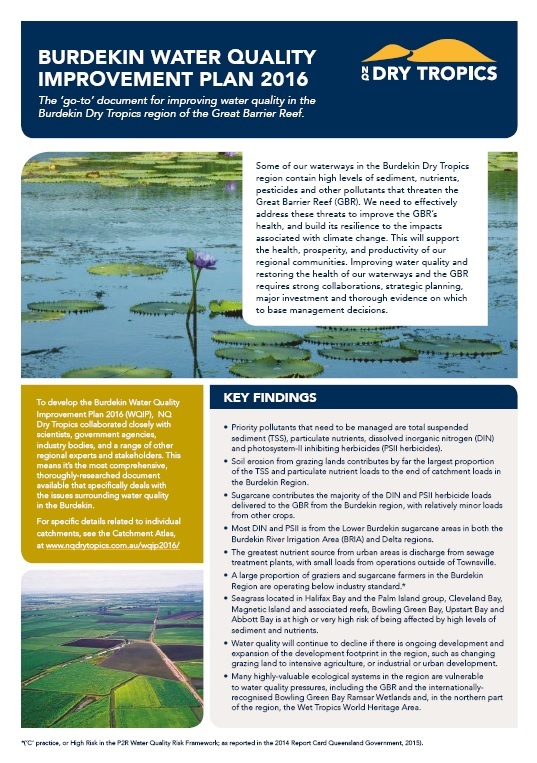 Click here to view a short summary that outlines the key points of the Burdekin Water Quality Improvement Plan. Click to download PDF document (warning very large file ~64Mb). Please contact the NQ Dry Tropics Office to be mailed a hardcopy version. Water quality is a one of the key factors in determining the future diversity and productivity of the Great Barrier Reef (GBR). The primary objective of this Water Quality Improvement Plan (WQIP) for the Burdekin Dry Tropics Natural Resource Management (NRM) region is to support and guide decision making and investment around protection of the GBR and the local ecosystems as they relate to water quality and to which its resilience is intimately linked. The plan is an attempt to address all human activities in the region which have the potential to have a major influence on regional water quality. This plan consolidates information into a guide useful to anybody working to improve the quality of water in the Burdekin Dry Tropics region of the GBR. It updates and builds on the 2009 Burdekin WQIP and the Black Ross WQIP (2010) and the learnings of those involved in their delivery, extending both the geographic area and range of issues covered. It has been written for use by all levels of government, industry representative bodies, non- government service and advocacy organisations, land holders and members of the Burdekin regional community. The plan steps through the logic to establishing priorities and strategies for managing water quality in the Burdekin NRM region; starting with an overview of the region’s water resource, aquatic and wetland assets followed by analysis of the pressures which influence the quality of natural waters. This lays the foundation for development of pragmatic water quality targets based on objective ecologically relevant criteria. Modelling benefit cost analysis then provides economic assessment and informs priority setting with respect to water quality improvement strategies and actions. The plan concludes with analysis and statement of what assurances can be given that investment in the actions will ultimately lead to the targeted water quality outcomes over approximately the next 30 years. 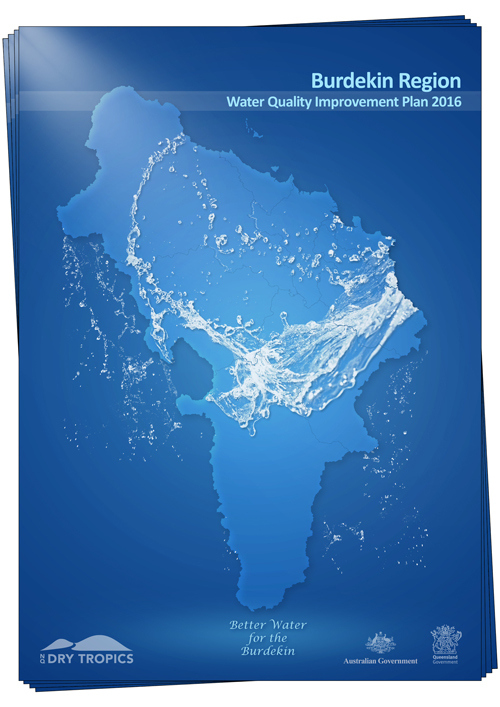 Why do we need a Water Quality Improvement Plan? What are the values of the Burdekin Region and what is their status? What are the water quality issues in the Burdekin region? What management goals and targets do we need to achieve water quality outcomes? What are the priority management options for meeting the targets? How are we are going to achieve the targets? What challenges do we face in the future?